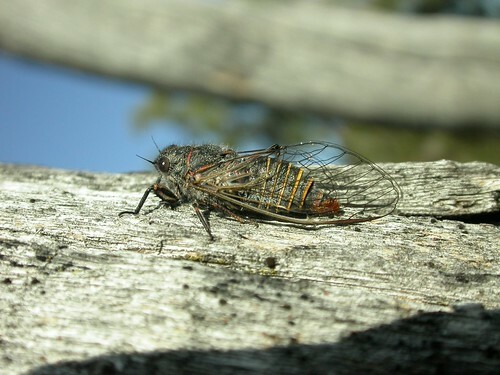 Kees Green sent us many photos of cicadas taken in Australia. See all of Kees’ photos, including a Tamasa tristigma and an aggregation of Macrotristria goding. Pauropsalta mneme, originally uploaded by dhobern. Found this on Flickr. Is this the same species as the latest mystery cicada? Thanks to David Emery for the tip. Can you help identify this Australian cicada (Pauropsalta mneme)? Can you identify this Australian cicada??? The photo was take by Elizabeth Barnett. Hi, I wondered whether you can help me identify a cicada we saw at Hall’s Gap (Midwest Victoria, Australia) in January this year? It had a limited tolerance for being photographed and took off asap. From memory its call was a sort of short “eck! eck!” rather than the continuous shrill you get from a greengrocer. There were heaps of them calling but this was the only one we saw. I’d estimate it was about half the size of a greengrocer. Looks pretty close to Pauropsalta mneme (Alarm clock ticker) with the orange belly and wing infuscations and is in the right place! Heard the first C.celis around Sydney last week, but very dry at present. After a Google search for Pauropsalta mneme I’d say David was correct.